2. I wanna run vg’s but has anyone had any vg experience on speedwings? 3. I’ve seen some people looking at challenger snap on plastic strut fairings, but I came across this article. I thought instead of doing one long span, just shorter runs to avoid using a long foam cutter. 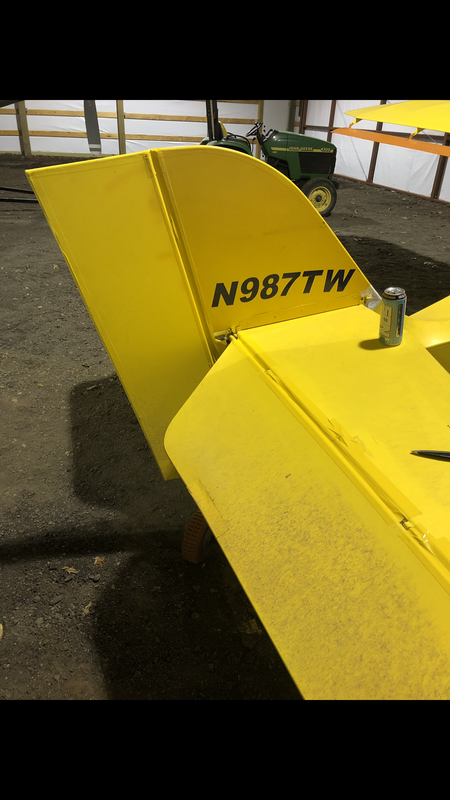 I was going to get make an airfoil out of thin steel, then sharpen one edge and just stamp it into foam to get 2” slices and tape them up on the strut. any other low hanging fruit? Thoughts? Comments? Suggestions? I'd suggest watching all the videos from The Arnold Company. Start with "Why It Goes So Fast" and pick your flavor from there. After his death, his family released all the videos to You Tube. They were originally only available by purchase. I streamlined my tail struts with no noticeable difference. I did my jury struts and believe I may have gained at least a couple of knots. The wood fairings on the struts are structural and are required. I upsized my struts on both diameter and thickness and then used the plastic fairings from kitfox. I keep threatening to pull those off and come up with a lighter weight fairing for the wing struts as the plastic ones are heavy! Didn’t realize they where structural...so maybe I can order the strut fairings from avid? Did the gap seals today, I had an idea to make the fairings out of foam still, then use my left over carbon fiber to laminate over, maybe that would be light and add sturcture. I’ll get the router bit so that I can make the female end for the tubes in the foam. Obviously, any forward-facing steps or flats should be rounded over. This will halve their drag contributions. Just adding a long tail to a round strut may help, but reducing the angular extent of the cylindrical forward end will do even more to enable attached flow, as will lowering the t/c of the strut section below the standard 33% by adding chordlength. In this flow regime the near-body boundary layer wants to be the wimpy laminar type, which is more susceptible to flow separation. Small surface roughness ahead of max thickness may help artificially coax it into its more robust turbulent form, which will lower pressure drag if there is any flow separation. Tufts and a GoPro will deliver the verdict. Needless to say, any excess flow ingested into the engine's cooling system beyond that absolutely necessary for cooling is a major source of drag. Without the wood fairings, keep it rightside up! 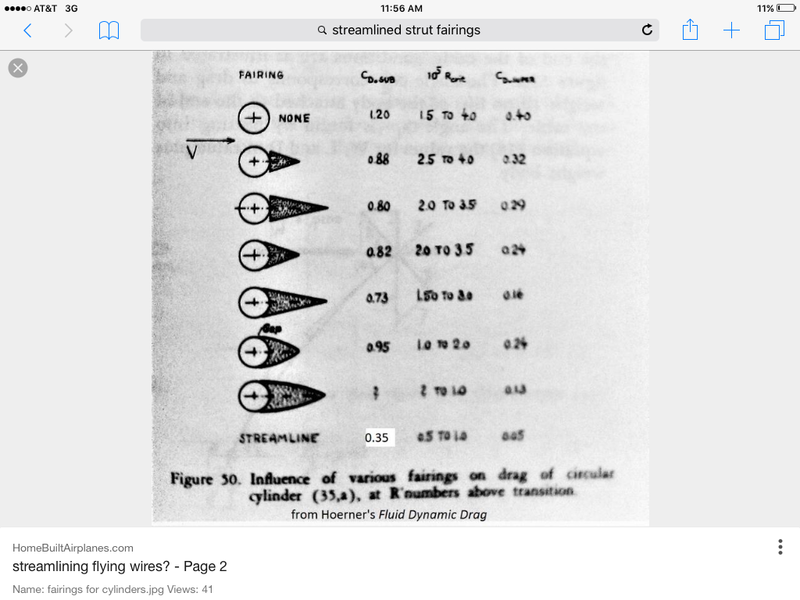 Structural value of the wood fairings is as stiffeners against bowing and potential column failure under negative Gs. Otherwise we might need inboard & outboard jury struts - yuck! funny you talk about inboard and outboard jury struts.....on my Catalina, Avid aircraft (or the CAA in GB) found they had to ad a jury strut because of the increased span (36ft)...The wing was not strong enough with only one jury strut. Thanks, Buckchop. Good stuff! I have this reference. Note, however, that the diameter of the tail struts is 0.41" (jury strut is 0.385" diameter) puts us well below the Rcrit in the table. At sea level, standard day, and 80 mph, Rd is only about 25,500 for the tail strut. This puts us squarely on the LEFT side of the table, stuck with the higher Cd numbers for these strut shapes. 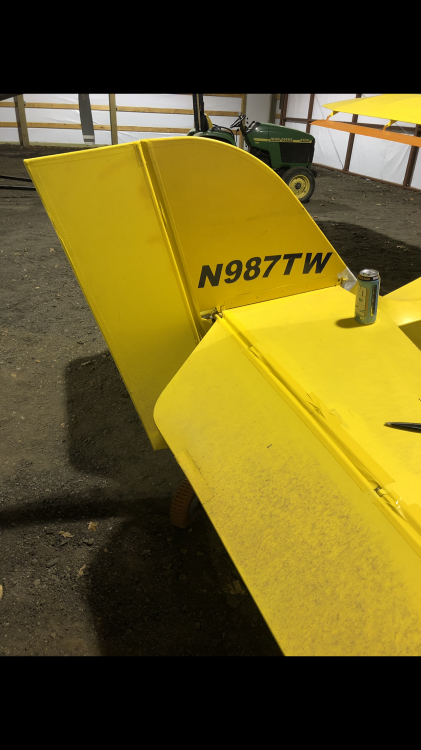 While a tapered tail helps, perhaps lopping off 40% of the drag, much more benefit is possible by scaling up a NACA symmetrical airfoil in t/c, then applying it over the strut as a hot-wired foam-cut shape. Will a NACA0033 shape work under these conditions? Yes, but can we do better with lower t/c? Likely yes. Need to look into low Rn strut data. Upon digesting this further, it looks like using NACA0027 (27% thick) strut shape at 2.5" chord, one could reduce 2-D strut drag to around 6% of that of the original round tail strut. Similar results could be obtained for the jury struts as well. Small roughness due to manufacturing (cloth weave) and of course bug splatter will help here, as a laminar boundary layer would actually increase drag. Either glue the fairing to the strut, so it won't rotate, or center the circular cutout as far forward as possible, but ahead of 25% chord, so it will want to align with the wind. Of course, VGs will increase cruise drag, slowing you down a little, and the lower stall speed could make landing rollout less exciting. But this comes at a cost, as it reduces maneuvering speed along with stall speed. Unless your H-tail has enough authority to fly you to stall without dynamic effects, i.e. in straight-ahead slow-entry stall, you may not even be able to benefit from the stall-speed reduction the VGs provide, but your maneuvering speed will still be reduced. Many have indicated that with VGs, stall AoA is increased so far beyond ground angle that they're of little use. Plus, they make your airplane harder to wash!